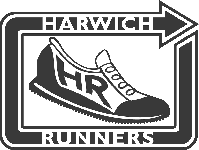 Forgot to ask last night, anyone else want to run on Sunday, please let me have your names before midday on Friday - thanks. Well done everyone today-brilliant result, even more so considering we had so many key runners off with injuries or illness Nice to have the support on the way round as well, with Steve popping up where you least expect him (as usual if he's spectating!) and the black and white hat brigade being heard from over 3/4 mile away (I kid you not!!). Going to run at Witham XC tomorrow. Travelling up solo. I can offer a lift or accept a lift from someone.